I've been busy writing guest posts for other blogs this week, so I'm giving you a little something different today. Here are pictures of my bookshelves. These don't include the about twenty or so fiction and nonfiction books scattered about my house (my husband swears there are more and that they're breeding under the bed--and they say that I have the imagination). I also maintain bathroom and bedroom collections, but these are not for public viewing--you should really thank me for that. The shelving units below are arranged in no particular order; that is the summer project that I intend to undertake along with getting rid of that striped wallpaper and repainting my stairwell. The first unit is often referred to as: that great bunch of books by the stairs. 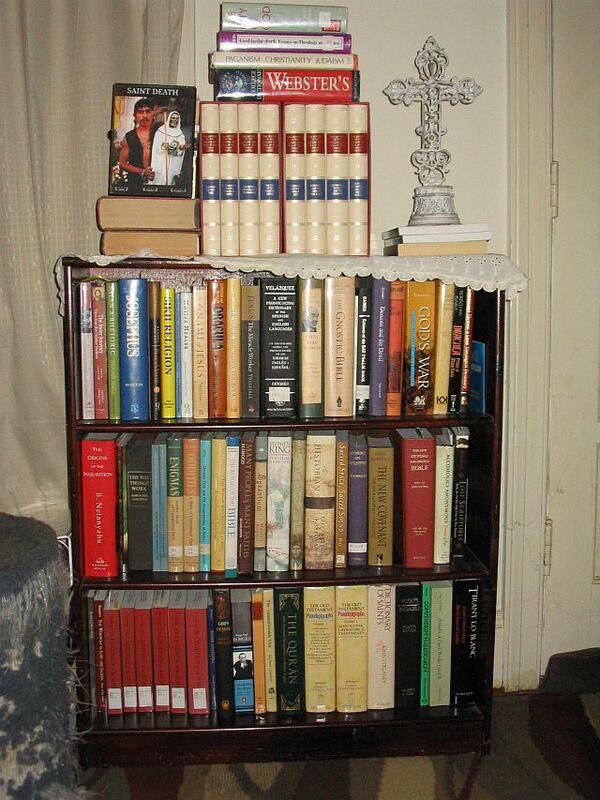 These shelves contain fiction and nonfiction, including a four volume set of The Taoist Classics, a three volume set of The Art of War, a four volume set of The Interpreter's Dictionary of the Bible, and Montague Summers' work Werewolf. Note the expensive cat toys beneath the sofa but no cat. That's because he is off in another part of the house, busily playing with a piece of paper. I call the next shelving unit my Santa Muerte shelf for obvious reasons (the Saint Death on the top shelf/left side is a DVD, not a book). Here we have works on paganism, Christianity, Islam, Judaism, in addition to some of my favorite books for research: Satan's Rhetoric, The Apocalyptic Imagination, Demons and the Devil, and The Devil. I found the cross at a flea market and purchased it for displays. As you can tell, my cats also love their scratching post, which they always use ... good kitties. So what's on your bookshelves?